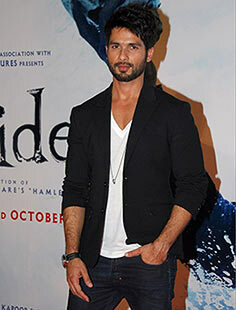 'I have honestly never gotten so much appreciation in my career ever,' Shahid Kapoor reveals. Shahid Kapoor has earned a lot of praise for his work in one of his toughest roles till date, in Haider. The actor basks in the glory, as he takes questions from Patcy N.
Were you expecting this kind of response for Haider? Not so much. Haider is a so unique that I don’t think any of us knew how people would respond to it. We believed in this film and we wanted to make it, but we had no idea what was going to happen. We were quite scared. I don’t think we would have released Haider on the date we released it, if we did not believe in the project. Haider released with a big film like Bang Bang. Two days before its release, the response to the trial shows was amazing. We got some amazing reviews. Once it released in theatres, the response was overwhelming. Haider is not an out-and-out entertainer. It’s very strong and emotional. After watching the film, you will walk out with tears and not with a smile. It’s not the kind of film you see to relax. Good content will always find an audience. We should not shy away from films that are risky. Your mother Neelima was all praise for the film. What was the best compliment you got? Irrfan Khan saw the film and he tweeted about it. He spoke really well about the film and my performance. I always ask my father’s opinion of my films. He said, ‘You got it all right.’ For me, that was the biggest compliment. My father is an amazing actor. I felt very cool about that. It was an unbelievable thing to hear from my director. My mom was so affected by the film that she did not talk to me for two days. Then one day, when I was promoting the film in Bangalore, I got a long message from her. It was half-an-hour-long message! She was so happy and proud. I have honestly never gotten so much appreciation in my career ever. Your film Kaminey, also directed by Vishal Bhardwaj, also did well. Do you work particularly well with him? I hope there are more directors I work well with otherwise he will be forced only to work with me! He always takes risks. He is one of the few filmmakers who will cast against popular belief. He tells you, ‘Let’s do something people don’t expect from you’. There are very few filmmakers who will take that risk. And whenever Vishal sir and I have taken those chances, it has worked for us. I hope Haider makes filmmakers say let’s give Shahid what he has never done before. What emotions did you experience when playing this character? I can write a book on that (laughs). I was really concerned. It was a difficult role. I was constantly worried whether I will be able to pull it off or not. The cast was Tabu ma’am, Kay Kay sir and Irrfan sir. This is their space. I had never done a film like this. Kaminey was a lot more mainstream in terms of character and subject. 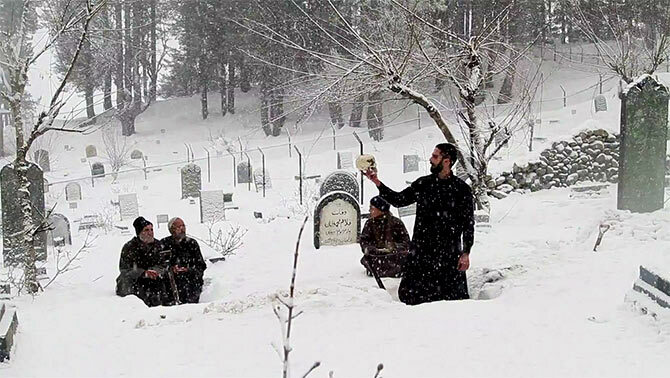 Haider was more about the character; there are no heroic elements to him. It was like stripping oneself and being honest to oneself as an actor. That’s why I was constantly worried about whether I had it in me to be able to do it. Was it traumatic doing those emotional scenes, especially the climax scene? We shot the climax (pictured above) -- especially the last portion where Tabu pulls the trigger -- in 15 minutes. We shot everything from there till the end of the film in just 15 minutes because we had no light. We were shooting in Kashmir when it was snowing. If you come to the same place the next day, it looks totally different because of the fresh snow. We had created a huge set for the last scene. People were dead and dying, there was blood and the blast... and we just had 15 minutes to finish it. Looking back, I can’t think how we did it in 15 minutes. Haider was made on a tight budget. We shot it in 54 days, though it’s a film that deserved 80 to 90 days to shoot. Every day was a different location so we had to finish one complete scene in whatever location we were at. The focus was on just finishing work. We did not have time to think about how we were performing. We just relied on Vishal sir’s judgment. If he said it was okay, we moved to the next location. Half the time there was no monitor because we were shooting in the snow. The vans would be stuck because there was so much snow on the road. Sometimes the generator couldn’t reach the location. The cameraman did an amazing job -- he shot half the film without external lights because it was impossible to get lights to many of the locations. Two scenes that were brilliant were the ones where you wear the noose and act crazy, and the Bismil song. We shot Bismil in trying conditions. The temperature was -15 and -17 degrees Celsius. While dancing, after every two steps, everybody had to sit down. The air is so thin and we were not used to dancing in that kind of weather. We were all wearing five layers of clothing and it was difficult to move with that weight. The song was the most important part of the film. I have done many songs in my career but I have not done a song where emotion is driving the song. It reminded me of the song from Karz that everybody remembers. By the time we shot Bismil, we were all into the film completely. I was fully in Haider mode. The anger was all coming from inside. I felt like Kay Kay actually killed my father and I had to take revenge. I was actually feeling those emotions! I was the most nervous doing the crazy scene. It was a monologue of six pages! I was staying at the Taj Vivanta. There was a bath tub in the middle of the huge bathroom. Every night after the shoot, I would sit in the empty bath tub and read that monologue for one hour. I did that for a week. I couldn’t change a single word of the monologue, because it was specific. We shot the scene on the last day of shooting in Kashmir because I had to go bald for the scene. A week before, Vishal sir told me, ‘I have never given any actor a monologue ever, not even your dad (Pankaj Kapur), or Irrfan (Khan), or Naseer (Naseeruddin Shah), or Omji (Om Puri). Nobody has got a six-page monologue from me, so you better do a good job’. You are good when you are working with directors like Vishal Bhardwaj or Imtiaz Ali (who directed him in Jab We Met). Do you think they tap your potential better? No actor can be better than the director or the script. That is something actors take time to understand. Being a star is a different journey and I am not talking about that. But as an actor, you can’t rise above the script, above the filmmaker’s vision of the character. So the aim is to work with the best and to work with people who will bring out the best in you. The filmmaker is the captain of the ship, but the entire team is important. I don’t think Haider would have been possible without the camera work of Pankaj Kumar, or the background score Vishal sir created, or the kind of cast that we had. You are not asking me about my chemistry with Shraddha (Kapoor, costar)? How did you see Tabu as your mother in the film? First of all, she refused to play my mother in the film. Vishal sir took a long time to convince her. I didn’t looked at her in awe; it was just like I am Haider and she was my Mauje (Mother). I was only nervous working with my father when we shot for Shaandaar. When you are shooting, it is just about action and reaction. When there is a brilliant actor in front of you, it brings out the best in you. Really, you think like that? There are two very distinct films being made right now. One category is films like Haider made for Rs 25-35 crore, so the release size of such films is much smaller as the audience for such films is limited. The other kind of film needs to make huge money because it needs to recover its cost. A film like Queen was made for Rs 17 to 18 crore and it did business of more than Rs 60 crore. It is considered a blockbuster because it made three times the profit from its investment. Barfi, Kahaani and Haider fall in this category. 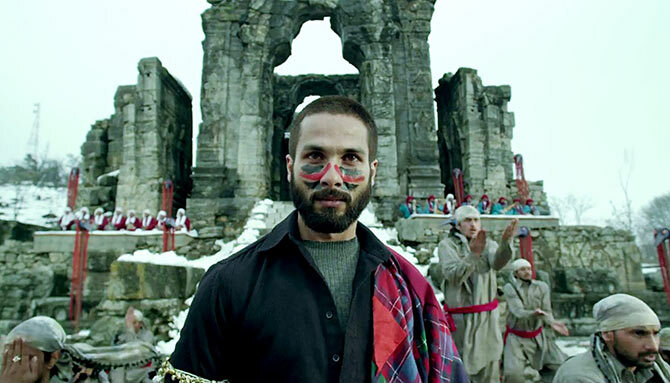 The business brought in by Haider should be considered against the size of its release. It was released in 1,000 to 1,200 screens. In comparison, my film R...Rajumkar was released in about 3,000 screens. Films made on big budgets of Rs 100 to 140 crore need to be released in 3,000 to 4,000 screens so that they recover their cost. I am happy that Bang Bang has done well but I think Haider has done way more at the box office than we expected. Eventually, Haider will make as much money as R... Rajkumar. You have been in the film industry for over 10 years now. Any regrets regarding your career? Lots. I have made many wrong choices. I never talk about them. But there are many films which I saw later and thought, what was I doing in this film? Tell us about your next film, Shaandaar. It is exciting to work with Vikas Bahl. I loved his last film, Queen. This is the first time I am working with my father. My father plays Alia Bhatt’s father in the film. My sister Sanah plays Alia’s sister. The film will release next year. Karan (Johar) and I have been planning to work together for the last eight years and he is producing this film. My friend Madhu Mantena of Phantom Film is also producer of the film.